This Carnelias plant and the tiny mushrooms (at bottom) are part of the Edmar BE Primavera design. This Carnelias plant and the tiny mushrooms (at bottom) are part of the Edmar BE Primavera design. 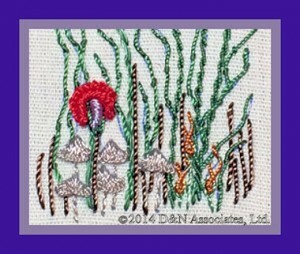 Worked in EdMar rayon threads, the stitched area is approximately 2.5 inch x 4.75 inch. 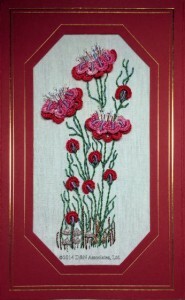 I framed this finished piece in a deep red, cut-corner window style tri-folded card (purchased from the Nordic Needle website). The card size is: 4.5 by 7 inch, with a 2.9 x 5.4 inch cut out. samples of z- and s- twisted threads. 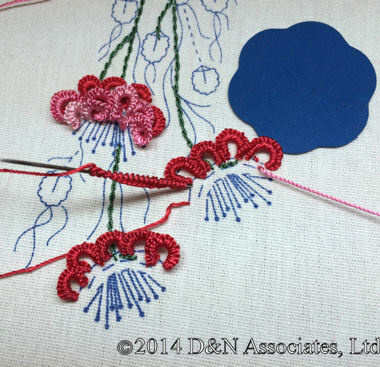 view the stem and outline stitches using z- and s- twisted threads. The EdMar rayon threads comes in seven weights. 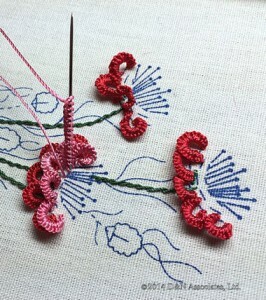 You can tighten and loosen the thread as you work to get different texture look. This worked piece uses threads of the first five weights shown on the web page EdMar thread weights. One down side of EdMar rayon threads is the dye lots. Buy two skeins of the same weight and color from a different dye lot, you often get slight difference in the color shading. So when you need to purchase more than one skein of the same weight and color request the store to check that they are coming from the same dye lot. These are three web stores where I purchase my EdMar rayon threads and kits: jdr-be.com, NordicNeedle.com and stitchingshop.com. These three web stores have great customer services, I have often emailed each of them as I looked for a particular shading of a color hoping they might have it in stock. Web surfing I found photos of seven BE designs with stumpwork in them that I wanted from various designers, I emailed the stitchingshop.com store and she shipped all the designs to me plus suggested several more. Notice the upright needle. This is how I like to create my detached butterholes and bullions. With a knotted rayon thread, I first came up from behind the fabric, then stab stitched the threaded needle down through the fabric and came back up, right next to the beginning of the thread with care not to snag the thread knot behind the fabric. 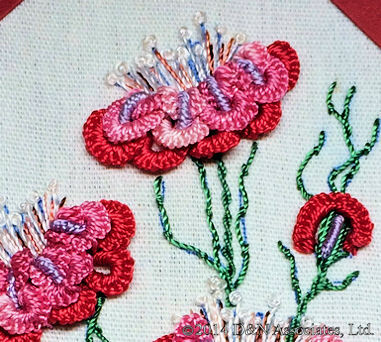 I like doing the stitches this way, with the needle upright through the fabric because they I can see that the tension of all the loops are the same as I form the petal. For one of the websites that offers Brazilian Embroidery stitch instructions, click here. I wanted to remark about the right most set of orange-red petals. In the photo above this set of petals is rather unruly. This rightmost set of orange-red petals was where I started to work and I was pulling the thread too snug around the needle as I am the detached buttonhole loops. Luckily I got those petals to settle down by doing three tiny stitches (just catching the thread and stabbling the needle straight down through the fabric) on each petal. One tiny stab stitch at each end of the petal and one near the middle top. Another thing I remembered as I just finished that first set of orange-red petals was that I like to use thread wax on my thread as I form bullion like stitches. It makes it easier to pull the thread through loops and also for petal and bullion stitches I feel the waxed thread lies better when the stitch is finished. I use a tiny ball of wax (for this photo I stuck my little piece of wax on my stretcher frame holder, right under the pink thread). I put the small ball of wax between two fingers and lightly pull my thread through one way, then I pull it lightly back over the wax going the other way. In this photo the pink rayon thread has already been waxed and you can see there isn’t any wax pieces showing on the thread. 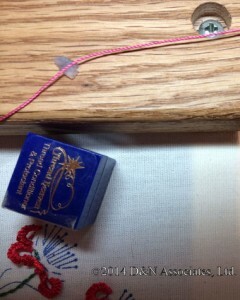 I just want the lightest touch of wax on the thread after I pull it through my finger tips holding the wax ball. Close up of finished flowers and I added this photo of the mushrooms at the bottom of the worked area to show how cute they look. The mushrooms were easy to stitch and fun.